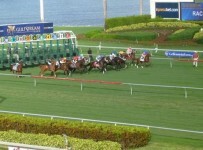 Racing is back on the turf on Sunday at Gulfstream Park. 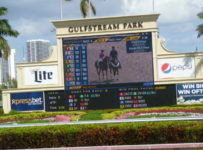 The dirt track is listed as fast and the turf is listed as good for an 11-race card, with first post at 1:15 p.m.
On the three days from Thursday to Saturday, rain forced Gulfstream to move all of its scheduled-for-turf races to the dirt track that was listed as Sloppy. We will have reports on today’s racing on our blog, which can be accessed om the menu bar at the top of the home page of this Web site.